Using a cheese grater, grate cucumbers. Place cucumbers in a fine metal strainer and press out the juices with a spoon. Set aside. In a food processor combine lemon juice and olive oil. Pulse ½ cup of greek yogurt at a time to emulsify with the oil and lemon. 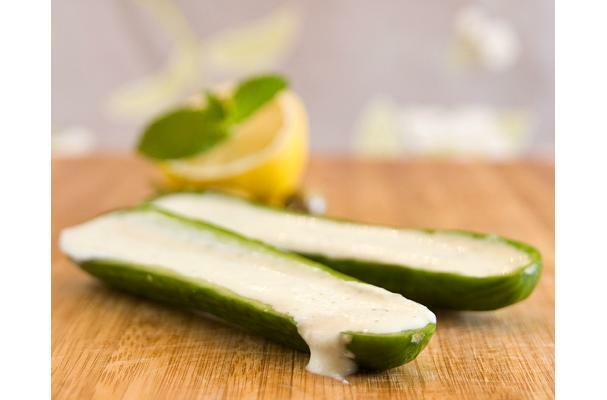 In a bowl combine yogurt-olive oil mixture with reserved grated cucumbers, minced garlic, and fresh mint. Salt and pepper to taste. Refrigerate for a minimum of two hours to allow the flavours to merge.